My first abutilon entered my life last summer and I am madly, desperately in love with it. I’ve fallen head over heels for its sisters and cousins, too. There are about 150 different kinds and (I hope my husband isn’t reading this) I want them all. My first one is like the orange one here, and my last haul is like the one up top except they have speckled leaves ~ the result of a virus that’s not harmful to the plant. They are also called Chinese lanterns and parlor maples. Parlor maple is a hint that this is an old fashioned plant, which means it’s out of fashion and harder to find. You’ll need to look for them at “real” nurseries. I mean no disrespect to the home stores. I get lots of plants from them. By “real” nursery, I mean the kind that has some unusual perennials in the back and someone who knows all the plants’ latin names to tell you how to love and care for them. If you don’t frequent a nursery like that, go out of your way to find one. You’ll be delighted. Flowering maples get their name from their leaves which are shaped like maple leaves. There’s nothing maple about them other than that. They’re kin to cotton, okra, hibiscus and hollyhocks. You’ll have a real hard time finding symbolism for these gorgeous flowers. They’re a mallow, which helps considerably with the symbolism. Culpepper places mallows under the rulership of Venus. Scott Cunningham gives them to the Moon. The flowers are for love, protection, and exorcism. We’ve all had a bad love we’d like to exorcise, right? Color plays a role in the symbolism, of course. 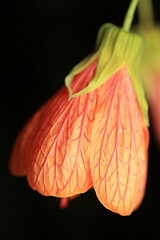 Abutilon comes in lots of colors. They are just stunning. If you can find one, pick it up. Pick up two and give one to someone you love. Abutilon are classified as annuals, but mine survived through the extremely warm winter this past year (zone 8a). I transplanted my newbies today (waxing Cancer Moon). I still have some in their nursery pots. I’ll transplant them during the waning phase and see which ones fare better.